Fr. 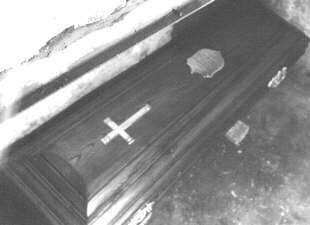 Valentine's coffin in the crypt. Click for new 2006 photos. The following letter was scanned from an unsigned copy in Annabelle Laudeman's papers, received from her paternal grandmother, Dorothea Schaaf Coughlin Schmidt, Fr. Valentine's half-sister. Father General arose about 5:30 A. M., when Brother Julio heard him coughing. He went into his private chapel to say Mass about 6 o clock. He prepared the Missal that seems about as far as he got. He must have wished to return to his bed, but collapsed upon it. Since the Brother had been often told by the General not to disturb him if he returned to bed, he did not go back to the apartments of the General until about 7 o'clock. On finding him unconscious, breathing heavily, he called Brother Genesso, the infirmarian, who immediately got Doctor Franze, the friar house doctor, and Father Schmoll, who administered the Sacrament of Extreme Unction. Two other lay doctors were immediately called, but, when they arrived between 9 and 10 o clock, they found they could do no more than approve what Doctor Franze had already done. It was a cerebral hemorrhage, a stroke, that had happened to the General. The Holy Father was immediately notified and about 9 o clock he sent his blessing. In order to drain the blood off the brain, the doctor opened up veins in both arms. A quantity of dark thick blood came out. At 10 0 'clock the doctor said that if he lived forty-eight hours he would have a chance. The General never regained consciousness. During the many hours from morning to evening members of the Curia, the Procurator General, Pacirico Perantoni, and the General Definitors Dominic Mandic, Polycarp Schmoll, Flannan O Neil, Raffaele Pontrandolfi, Augustine Szepinski, Francisco Adelgunde, and Father Alfredo Polidori, Secretary of the Order, were almost constantly in the room, and prayers in common were said at frequent intervals. Fr. Hugolinus Storff, the venerable old friar from California, former Definitor General, also came to pray. About 3 o'clock, Cardinal Salotti, Protector of the Order, arrived and stayed to the end. Many other friars also dropped in to pray for the recovery of the General. About 3:30 Father General, who never regained consciousness, began to have extraordinary difficulty in breathing, which the doctor and the infirmarian could not relieve even by their most tireless and painstaking efforts. Gradually the pulse grew weaker, and at 4:45 P.M., December 1, 1946, he breathed his last very quietly. The room was filled with the Fathers of the Definitorium end other friars reciting the prayers for the dying. There's no gainsaying that the unexpected death of Father General was a terrific shock to all. He himself had begun the retreat the Friday evening before. That same day at dinner be had announced the second anniversary Mass of his predecessor, the Most Reverend Leonard M. Bello, O.F.M. When the Minister General had arrived at Ciampino Airport, Rome, on Nov. 22, just nine days ago, he seemed to be perfectly well and full or energy. About four days ago, however, he told me (Rev. John Berchmans, His Secretary) that he felt extremely tired. No doubt, it was the reaction from the four months strenuous trip in America setting in. On Thanksgiving Day, while at dinner at St. Isidore's Rome, with the Irish Friars, he was afflicted with a sudden and violent case of coughing. More over, he complained of not being able to sleep the whole night through, waking up very early in the morning. However, no one could realize he was so near death. Up to the opening of retreat Friday evening, he was always busily occupied, receiving visitors the whole morning and attending to official business the rest of the day. The night before he died, after supper, he called the Secretary of the Order to his room for some business. A letter to Father Alfred Herman, O.F.M. of Cincinnati, which he wrote some time that same evening, was found on his secretary's desk, when the latter was called Sunday morning to the room of the stricken Minister General. The entire past week, without doubt, was too much of a strain. The busy week was begun immediately after his return from the States by the Beatification Services in St. Peter's and a public audience with the Holy Father on Wednesday. Then, came a Triduum in honor the newly-beatified martyrs during which be had to be host to visiting guests and high prelates. Immediately after his death, his body was dressed in his habit and a purple stole placed around his neck. He lay on the bed on which he died. All night long a vigil was kept by the friars; students of the Athenaeum and many others who dropped in, for the repose of his soul. Funeral will be Wednesday. Details of this later. F. John B. Wuest, O.F.M. (Left) Fr. Valentine's casket is carried to the waiting hearse. Most Rev. Fr. Pacifico Parantoni - named to succeed Fr. Valentine, precedes the coffin. 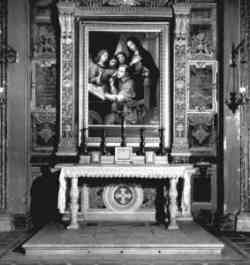 (Right) The altar of St. Bonaventure in the Church of Ara Coeli; Fr. Valentine is buried in the crypt under the slab before the altar. 2006 photos here.